Taking delivery of your new BMW is a memorable experience for sure, but imagine driving your new car straight out of the factory in Germany and hitting the Autobahn? Take a European tour with us now to learn how a local BMW owner worked in a trip to Europe as part of his new car purchase. Pictured with their new 2017 BMW M3 inside BMW Welt (World), is Leith BMW customer Heath Hayes and his wife. European Delivery is an option provided by many luxury European brands, including BMW, but maybe you’ve never heard of it. Here’s how it works. After taking delivery at the factory in Munich, it was off to find some great driving roads like the Stelvio Pass in northern Italy. Visit Leith BMW in Raleigh, pick the BMW model of your dreams (as well as your favorite bells and whistles) and select the European Delivery Program option. BMW will give you a 5% discount off the base MSRP, which you then use to plan your trip to the famous Welt factory in Munich, Germany. 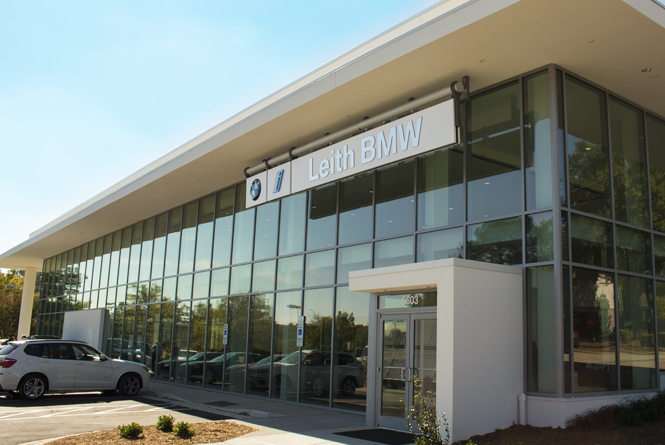 Your BMW European Delivery experience starts here at Leith BMW’s state-of-the-art showroom in Raleigh. When you arrive in Munich, BMW will shuttle you to your very own Premium Lounge reception where you’ll be presented with your new BMW and get to know her. Once you become properly acquainted, it’s time to hit the open road. While you’re in Europe, BMW wants you to see as much as you can. Part of the program is two weeks of insurance and registration, so you can drive your brand-new Beamer all over Europe. Just imagine, this could be you too. Taking delivery of your new BMW at BMW Welt in Munich. What a way to break in your new BMW, experiencing the beauty of Neuschwanstein Castle in the Bavarian Alps. When you reach the end of your time in Europe, you can pick one of over a dozen drop-off locations, and they will handle your car’s shipping back to its new home in the United States. Once your pride and joy sets sail from Europe, it will take approximately 6-10 weeks to arrive back at Leith BMW, where you’ll be reunited with the best vacation souvenir ever – your brand-new BMW. Click here to learn more about BMW European Delivery.